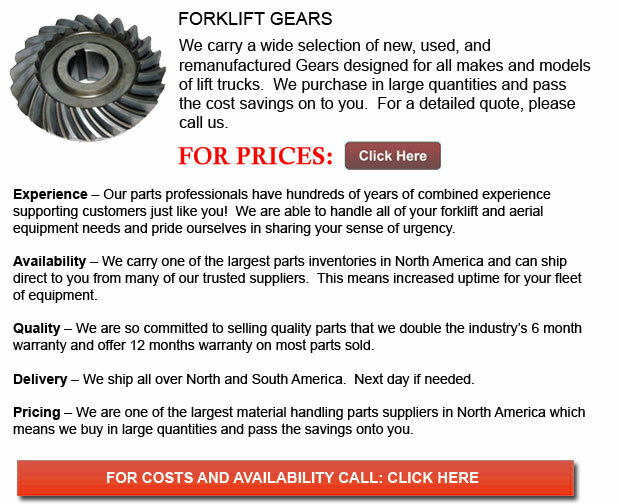 Forklift Gears - Among the more common types of pump for hydraulic fuel power applications is the gear pump. The gear pump works by using the meshing gears to be able to pump fluid by displacement. These devices are also usually used in order to pump fluids with specific velocities in chemical installations. Two main kinds of gear pumps exist. Internal gear pumps use an an internal and an external spur gear and external gear pumps use two external spur gears. Gear pumps pump a constant amount of fluid for each revolution. This defines them as positive or fixed displacement. A few gear pump machines are designed to operate as either a pump or a motor. When the gears on the pump revolve, they separate on the intake side of the pump. This creates a suction and void that is filled by fluid. This fluid is carried by the gears to the discharge side of the pump, and this is whereby the meshing of the gears operates so as to displace the fluid. There are very small and tight mechanical clearances, that along with the speed of revolution effectively avoid the fluid from leaking backwards. The rigid construction of the gears and houses provides the pump its ability to be able to pump highly viscous fluids and allow for excessively high pressures.